If you’re a Recreational Vehicle enthusiast, you live in a great part of the country! We have an abundance of sunny, rain-free days and some of the most dramatic desert terrain in Southern Nevada that people travel from all over the world to see. The stunning views of the Grand Canyon and the camping and activities of Bryce Canyon, Zion, and Death Valley National Parks are within a day’s drive away from the Las Vegas and Henderson areas! With so much to do and see with your RV you’ll want to be able to load up your family and hit the road when the mood strikes! But storing an RV, 5th Wheel, or Travel Trailer has its challenges, especially relating to your electrical system. With a lack of regular use, the batteries are prone to draining which makes it difficult to use your RV when you’d like to. Having Penny Electric install an RV Hookup on your property is the best way to store your motorhome or trailer. Typically, RV Hookups bring electricity, water, and sewage lines to a remote location and they are a familiar sight at campgrounds, mobile home parks and some storage yards. But it may be cheaper and easier than you would think to have an electrical Hookup installed at your home. Installing RV electrical hookups is a very straightforward process that only requires a RV power hookup box and a standard 110 volt 30 amp circuit run from your home’s master breaker panel. Running an extension cord out a window of your house to plug into the RV is NOT the way to go! Long cable lengths mean increased resistance, power loss and higher risk of exposure that could result in breaker trips or fire! A standard electrical outlet’s load capacity simply won’t support the electricity demands, especially if you plan on powering your RV during storage. For safe and reliable operation, RV hookups require a dedicated circuit with adequate current ratings. 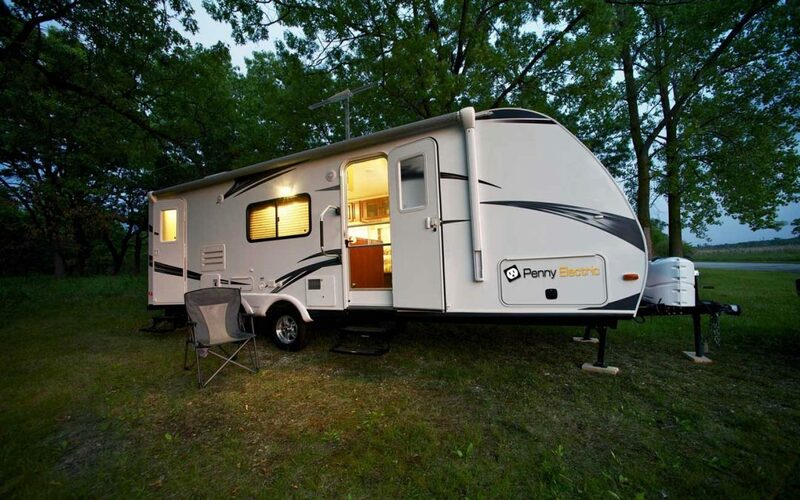 Other benefits of letting Penny Electric install power hookups for RV storage on your property include the ability to use accessories including lighting and refrigeration while your RV is stored. Your RV can provide an extra room for visitors with all the same amenities within your home. Functional RV storage can also provide opportunity for short and long term use if you would like to offer the living space to guests or via online rental providers such as Airbnb. With an RV hookup, tenants will enjoy their stay and their living space will be comfortable and in compliance. Power hooksups at locations that accomodate RV parking can also increase appeal and property value, making it a great investment for those who can also utilize the benefits while living there. Don’t cut corners with extension cords or noisy generators. As a licensed electrical contractor, Penny Electric has installed hundreds of RV Hookups in Las Vegas / Henderson, Nevada area. Let us help you with yours!